The former house 'Listad', at 7 Clifton Road (now known as Clifton Park Road) home of the Bennetts in 1911, has another claim to fame. The previous householder was George Jennison, born 1872, 'Animal Superintendent, Zoological Gardens - the Zoological Gardens in question being the famous 'Belle Vue' attraction founded by John Jennison, his grandfather, who had previously run a pub with small menagerie at the building that became 'Adswood Lodge' in Stockport. 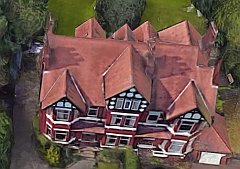 'Listad' was one of a pair of large semi-detached houses which has since disappeared as Stockport Grammar School has expanded its grounds. It was one of the early houses to be constructed in the Davenport Park estate, which was developed in the 1890s, and the Jennisons are mentioned at that address in an 1896 newspaper item, so it is most most likely that they were the first occupiers. George Jennison's wife Garbrielle was of French ancestry; why she (assuming that usual custom of the period applied) chose the house name - apparently from a place in Norway - we have not discovered. He was active in local politics: a 1903 list of candidates for an election in Gorton (which included Belle Vue) listed George Jennison of 'Listad', Davenport but gave his occupation as 'Cycle Maker'. In the 1901 census he is shown as 'public entertainment caterer and cycle maker'. The cycle-making firm, run in partnership with other Jennison family members, was 'The Leander Machine Co.' with premises in Mawson Street Ardwick. From 1919 he became Joint Managing Director of the Gardens until the Jennisons sold the business in 1925. On leaving Davenport around 1909 the family moved to Barwicke Lodge, Red Lane, Disley, a large and secluded house where he died in 1938. After the Bennetts (see main page), by 1950 No.7 appears to have been home to Horace Edwin Davenport (born 1894), a boot and shoe maker and repairer, his wife Elizabeth and son Derek. In 1830 and 1939 he had been listed at 103 Adswood Road, a shop within a terrace which was cleared in the 1970s. In 2018, the house, like no.9 and several other neighbouring houses, no longer exist, lost in the expanding empire of Stockport Grammar School. It appears that the pair nos. 5 and 7 were purchased in 1953 by the Governors of Stockport Grammar School and merged into one building for school use, and later re-created as purpose-built structure. In 1939 No.5 was the home of the school headmaster. 46 The Crescent, home of Frank Reginald Bennett and his son Edmund, is like 7 Clifton Road, one of a pair of large semi-detached houses (later dubbed 44 and 46) both of which still stand in 2018; 46 is on the left in the Google view. The houses were built in the late 1890s on land which had been previously owned by nurseryman John Hooley. He had purchased land in the area from the Freeholders Company, owners from 1877 of the Bramall Hall estate. The pair of houses was christened 'Cleveland Villas'. The first residents of the five-bedroom Arts-and-Crafts style house were the Ashcroft family. Manchester-born Henry Newton Ashcroft (born 1834), his wife Charlotte (née Howard), and their family who lived at 94 Wellington Road North, Heaton Norris, in the early 1890s. He was listed as a a warehouseman in 1891; a newspaper report at the time of his funeral reveals that he was connected for 42 years with the Manchester firm of Rylands and Sons. He died in 1897, by which time the family home was Mellor Hall, an ancient farmhouse in in the hills near the Cheshire - Derbyshire border. Perhaps he retired to the countryside for health reasons. Among the mourners were his six sons and five daughters. It was noted that one of his sons, Edward Maynard Ashcroft, a medical officer by profession, played cricket for Derbyshire. His eldest son Henry Howard Ashcroft (born 1860) was a 'marine engineer' in 1891 although in 1881 he had been a boarder in Rawtenstall, Lancashire, 'learning cotton manufacturing.' After his death the family re-located to the new house in Cleveland Villas, which they named 'Braeside.' At that date, The Crescent was part of Bramhall; the boundary was re-drawn in 1901 to incorporate the area in Stockport. In 1894 Henry Howard Ashcroft (known as Harry) had married Mary Bertha Wagstaff Deacon and established a household of their own of their own at 86 Bramhall Lane, Davenport. By 1911 they had moved in to 'Braeside', with their children Bertha Winifred Ashcroft (15), Hettie Margaret Ashcroft (12) Charlotte Gertrude Ashcroft (10), Henry Bernard Ashcroft (2), and a servant. Lydia Iles (20) born in Sheffield. By this time Henry Howard Ashcroft had his own business, manufacturing Velveteen, a type of cotton cloth made to imitate velvet. He died in 1923, and in 1925 his widow sold the house to Frank Reginald Bennett. She died in 1950 in a private mental hospital in Peckham, London where she had been living for a number of years. Frank Reginald Bennett lived in no.46 until died in 1943, the same year as his father. His widow Edith Doris Bennett stayed at No.46 until moving, around 1959, to a smaller, but detached house at 1 Nevill Road, Bramhall nor far from the border with Davenport. The next occupants, as we pass from history into recent times, were John and Hilda Shorrocks. There are no doubt many stories hidden behind the doors of the old houses in leafy Davenport, but few can be as curious as that of Captain Edmund Harley Bennett, formerly of No.46, The Crescent. A story that remained secret, even from his own family, until long after his death: he was selected to assassinate Adolf Hitler. By June 1944, once the Allies had made a successful landfall in France and were advancing towards Germany, there were some Allied military leaders who felt that victory was inevitable, and the war might be shortened if German leader Adolf Hitler could be 'dealt with'. Not all the high-ranking officers involved in the discussion were convinced; some felt that Hitler's strategic blunders were likely to assist the Allies, but preparations went ahead, including the creation of a 120-page dossier recording Hitler's lifestyle and daily routines, based on information garnered from prisoners of war, old maps, etc. Various ideas were discussed, including a 'bazooka' attack on Hitler's car, poisoning the water or food on his personal train, or throwing a suitcase full of explosives under the train. A method involving anthrax spores was considered; suggestions for hiding the minute dose of anthrax required included using a fountain pen, hollowed-out spectacles or false teeth. The planners of what was code-named 'Operation Foxley' concluded that Hitler's morning walk to the teahouse was the best opportunity for a sniper attack. A German who had been part of Hitler's personal guard had been taken prisoner in Normandy. He revealed that when at the his mountain home the Berghof, near Berchtesgaden, Hitler always took a 20-minute morning walk at around the same time (after 10:00). He liked to be left alone during this walk, leaving him unprotected near some woods, where he was out of sight of sentry posts. A two-man team disguised as German mountain troops, made up of a sniper (armed with a Mauser Karabiner 98K rifle fitted with a telescopic sight capable of accuracy at 1000 metres) and a German-speaking Polish agent with powerful binoculars to act as spotter, would be waiting for him. They were also to be supplied with a captured Luger pistol with a custom-made silencer to dispose of anyone who got too close. What is said to be the actual pistol issued to Captain Bennett is in 2018 part of the Donnington Collection, housed at the Combined Military Services Museum in Maldon, Essex. During the Blitz, when his duties involved patrolling the streets of Liverpool, he lost his front teeth and suffered arm wounds from shrapnel during a bombing raid. He was then posted to North Africa to fight in the battle of El Alamein where he was shop in the stomach. Back in Cairo, he suffered a fractured skull when he was beaten up while off-duty. During another spell in hospital, this time recovering from mumps, he was promoted to Captain. Eventually, due to his technical background he was sent across the Atlantic to the British Embassy in Washington as a Military Attaché to study enemy weapons and develop methods of neutralising them. What happened next remained a secret for many years. He was chosen to carry out the plan to shorten the war by assassinating Adolf Hitler at his Bavarian retreat near Berchtesgaden, in a proposed action devised in 1944 and code-named 'Operation Foxley'. 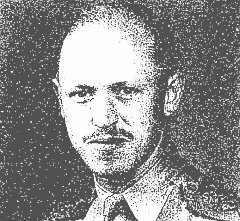 A top secret telegram sent by a senior Special Operations Executive officer to New York on March 16, 1945, read: "For your private information, we are considering using this man for a high priority assassination task and would require his lying low in Germany for considerable period collecting necessary intelligence to enable him to do the job.'' The reply read "He, far from being discouraged by my intimations of the possible toughness of the assignment showed even greater keenness". Why Edmund, one of about 6,000 diplomatic staff in the the USA at the time, was chosen was destined to remain a mystery; he was not known to be a skilled marksman, but with his fluent German he might perhaps have passed as a local. Perhaps his earlier studies in Germany involved more than just the textile industry. It has been suggested that he did undergo some training with a Mauser rifle in preparation for the mission. His personnel file in the Special Operations Executive records at the National Archive in Kew has been de-classified only since 2014, and was shown (above) in the 2018 documentary film, including his Davenport address which inspired our feature. 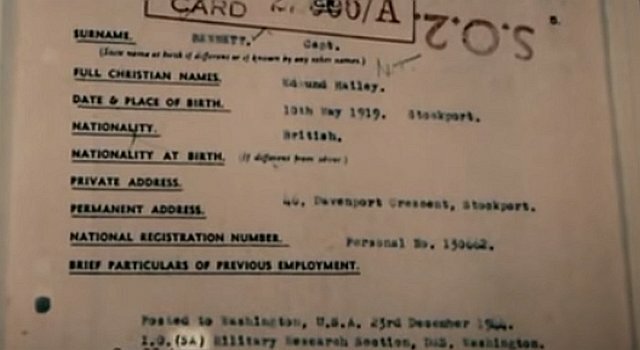 It appears that due to a clerical error, his middle name was erroneously entered in Army records as 'Hailey'. The film-makers stated that the 'SA' in his record indicated a familiarity with 'small arms, which would include rifles, which they suggest may have been the reason why he was chosen. The bold plan was never carried out; the information in the 120-page was out of date; Hitler left the Berghof for the last time in July 1944 and set up headquarters in a forest in what is now part of western Poland where he survived an assassination attempt by a group of his own officers. Experts differ on whether the Operation Foxley mission might have succeeded, but had it been carried through in 1944, it may well have saved many lives. Adolf Hitler took his own life in Berlin on 30 April 1945. In the same month, Edmund met his future wife Julia in a Washington restaurant; they married the following year and returned to Britain where he resumed his work in the family business, and they raised two children. In 1947 they were recorded living at 44 Fernley Road, Mile End, part of a small estate of typical 1930s semi-detached houses on the opposite side of the main A6 road from Davenport; by 1956 they were back in Davenport at 9 Egerton Road, next door to his late grandparents' home. In 1960 they disappear from the Manchester area telephone directory. presumably having moved away. The story of Operation Foxley only came to public attention in 1998, when some secret files were de-classified and came to the attention of the press. The 120-page report itself, was published in facsimile (in reduced paper size) as a book by the Public Record Office, with a 30-page introduction by historian Mark Seaman under the title Operation Foxley. Since then the operation that never was has been the subject of several articles, a documentary film, and fictionalised including a drama-documentary, and even a novel. Remarkably, Edmund, who lived until 1987, latterly in Leicestershire, never told anyone about the plan, even his widow who told the press in 1998 that she had no idea. Looking through the available evidence, it does seem odd that the plan was 'dusted off' as late as March 1945, when with the aim that the agent would 'lie low' in Germany. Perhaps there was a realisation that Hitler might no longer be at the Berghof, and the agent would be expected to find out where he was, or perhaps another Nazi leader was the target. There is some mention in the sources of a 'Foxley II.' In the end, we will probably never know. Edmund's family business was in the cotton industry, in particular the 'doubling' process - twisting threads together to produce a stronger yarn. His grandfather, Robert Wharton Bennett, was born in a working-class home in Salford around 1868. By the 1890s Robert was employed as 'manager of a cotton yarn doubling mill'; by 1901 he was living in a substantial Victorian semi-detached house at 39 Derby Road, Heaton Moor, Stockport with his wife Martha Bennett (née Taylor, born 1865), daughter Lilian Beatrice Bennett (aged 8), and sons Frank Reginald Bennett (6) and Robert Wharton Bennett (junior) (4). By 1911 Robert Wharton Bennett (senior) described himself as an employer, cotton doubling Mill, suggesting he had taken over charge of the business. At the time of writing we are unable to establish the identity of the firm; there was a Bennett family with mills in the Stockport and Manchester area, but they appear to be unrelated to these Bennetts. Information on this would be welcome. 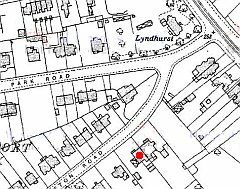 The 1911 census shows that the family had re-located to the up-coming suburb of Davenport, at 'Listad', 7 Clifton Road (now known as Clifton Park Road) in the private Davenport Park Estate, where they employed two domestic servants, a cook Kathleen Davies (born in Carnarvonshire) and her daughter Sydney Mary Davies. Robert Wharton Bennett (senior) stayed at 'Listad' with his wife Martha until he died on 29 January 1943 aged 76. Martha Bennett died in a Southport nursing home in 1953. Younger son Robert Wharton Bennett (junior) served in World War I; in 1917 he was commissioned as a Second Lieutenant in the Royal Northumberland Fusiliers, and later served in the Cheshire Regiment and the Shropshire Light Infantry. He survived the war, and married Eva Hepworth in 1924. In 1925, Frank Reginald Bennett, another son of Robert Wharton Bennett, purchased no.46 The Crescent, Davenport, and moved in with his wife Ethel Doris Bennett, their son Edmund Harley Bennett (born 1919) and daughter Mary W. Bennett (born 1923). Edmund was destined to follow his father and grandfather into the business, spending two years in Germany to study their textile industry. By 1939 Edmund was not present in Davenport, and Mary was listed as a student. They had a servant, Millicent Williams. Both Ethel and Mary were listed in the 1939 Register as members of the British Red Cross. Frank Reginald Bennett died in Ancoats Hospital, Manchester in 1943; his widow and daughter stayed at 46 The Crescent. Daughter Mary married Archibald Galloway in 1947. Ethel Doris Bennett died in Stockport, aged 90, in 1984. 'Mission: Kill Hitler'. Documentary shown on the UKTV Yesterday Channel, 2018. Full version on YouTube. Stuart Millar, "He was Just a Backroom Boy ... then they chose him to kill the Führer.'" The Guardian, 25 July 1998. Mark Seaman: Operation Foxley: The British Plan to Kill Hitler. Richmond, Surrey: Public Record Office, 1998. Mark Felton, Guarding Hitler: The Secret World of the Fuhrer. Annapolis, MD: Naval Institute Press, 2014. Paul Bernadi, To the Devil his Due. [novel] Createspace Independent Publishing Platform, 2014. Shahan Russell. 'British Plan to Kill Hitler'. War History Online website, 2016. 'Killing Hitler'. Drama documentary shown by PBS America in 2016. Trailer on Youtube. Our thanks are due to Mr Reilly for bringing the Operation Foxley story to our attention. James Shepherd, Shird Fold and the Power Pulley: stories of a Davenport house and its namesake. Jesse Lumb and the Crescent: a Yorkshire mill owner's investment. A postcard from Oberhofen: researching a house on The Crescent. The account book of 'The Alders', The Crescent, 1899-1917.